carburetor. For my asking price you get all that and a cool motorcycle. Honda technician said it has been babied long enough. and then make an appointment to see mine! 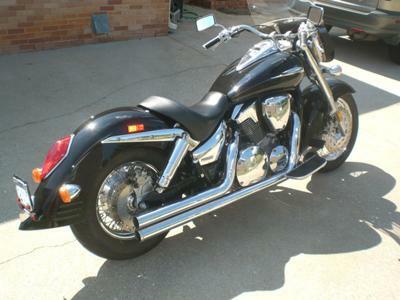 As you can see from the pictures of the used Honda 1300 VTX R for sale it is a beauty painted in shining black and covered in chrome. It is ready to be shown who is boss. If you feel that you are the biker for the job, leave your requests for more pics of the Honda 1300 VTX R for sale by private owner, specs or questions about parts and accessories in the space below provided for that purpose by GoGoCycles Used Motorcycles for Sale. Join in and write your own page! It's easy to do. How? Simply click here to return to HONDA VTX 1300 CLASSIFIED INVITATION.